Whether it's trying to organise something last minute, a little help with the catering, or hints to get you out of the kitchen sooner on Christmas Day, we all need a little help in the festive entertainment department. But outside of all the Christmas parties, there's so much other catching up to do at this time of year. Rather than a big she-bang, sometimes you just want a relaxed, no-pressure chat with a few close friends—accompanied by great food of course! Thankfully The City has collected some of Brisbane's best restaurants together in their handy guide to eating out over the Christmas period, Festive Feasts. We've done the tasty, tasty leg work to bring you our top tips from this fantastic list. HIlton's Vintaged Bar + Grill will be going festively fancy with a classy Yuletide High Tea. Christmas cheer is sprinkled delightfully through the menu - think fluffy scones served with conserves and fresh cream, fruit mince pies, praline logs, white Christmas and festive inspired macaroons - and there are four tiers of packages depending on your drink of choice: tea, French Champagne, sparkling wine or cocktail. Also on the menu is a Christmas Day lunch and dinner. Book now! Happy birthday Fat Noodle! Luke Nguyen's much-loved and super laid-back homage to his Vietnamese roots is turning one on the 12th of December and you're invited to the celebration. Order two main dishes from the delish Asian menu and the kind team at Fat Noodle will gift you Luke's signature Chicken Salad. Plus, there are Chinese lion dancers to keep you entertained! 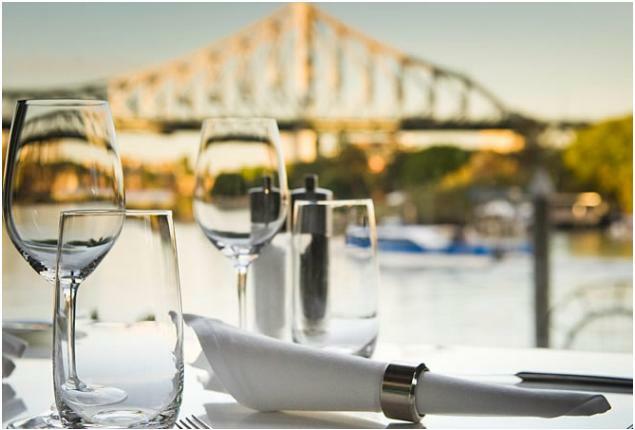 Another riverside dining spot throwing its hat into the festive ring with a NYE degustation, 'cause there's nothing like starting a new year with a full belly and rosy Champagne flush. Feast on morsels like crispy courgette flowers with herbed goats cheese and truffled honey or the braised pork belly with Dutch carrots and a sweet and sour glaze. Yum! What better time than the Christmas season to try something as fun sounding as the Iron Bark Coal Pit? With a daily rotating selection of juicy meats just perfect for roasting, we have our eyes on Thursday's Boer goat and Sunday's Meredith duck. Slathered with sauces like chimmi churri, ponzu and beetroot relish, vegetarians beware, you may be converted. Lunch is $24 and dinner is $59. David Pugh's institution, perched at the edge of the city, is just the ticket for classy pre-Christmas face-time with your nearest and dearest. For the month of December, Restaurant Two will serve a yummy, Queensland produce-driven à la carte Christmas Celebration lunch menu for $60 per person. Get in quick; this little gem will book up before you know it. Continuing their theme of refined, elegant fusion, head chef Shinichi Maeda has whipped up a special summer dessert known as the 'Momo'. This work of art is made up of crisp and juicy peaches poached in sweet umeshu (plum wine) on refreshing candy pink umeshu granita and garnished with seasonal blossoms. Our tip: don't share this beauty; keep it all to yourself. For those who really can't be bothered with all the hoo-ha that comes with cooking Christmas Day, the good folk at The Lab Bar + Restaurant are kindly giving up their precious holiday to bring you a delicious day of festivities. Three course dinner and drink packages start at $70, and Santa will even make an appearance for the young-uns! Borrowing from the Euro tradition of celebrating on Christmas Eve, Spring are putting on a special menu complete with turkey, seafood and Christmas pudding. Yum! Book for two courses ($60) or three ($80) and let someone else do the rest! Funky haunt The Villager is doing things right for Christmas. Two courses and a glass of wine will only set you back $35.95 per person (bargain!) but if you're feeling particularly festive, why not settle in for six delicious share plates and a cocktail jug (best invention ever) for $99 to get in the holiday mood? TUL Note: Today's List Love post is proudly sponsored by The City and endorsed by The Urban List. Our sponsored posts will never be a secret - the List Love seal will be stamped on any sponsored material you see on the site. Thank you for supporting the sponsors who make The Urban List possible.